Imagine a place where artisans, crafts people, and creative folks with diverse forms of expression all share a well-equipped physical space. 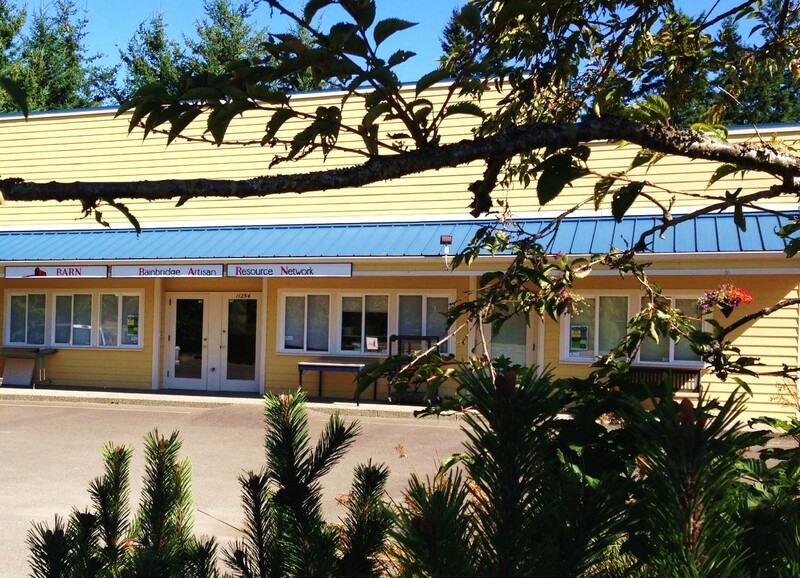 And imagine calling that space a BARN — which also stands for Bainbridge Artisans Resource Network. You needn’t imagine for long, because you can get a taste of the BARN for real this Saturday Sept 20th from 1-4pm. As you’ll hear in this podcast, BARN board member Catherine Camp speaks with BCB’s Annie Osburn about this Saturday’s free open house — called a “Saturday Sampler” — at the BARN’s large interim facility. It’s a bright yellow building near the corner of Valley Road and Sunrise Drive, just north of Bay Hay and Feed, in Rolling Bay. Even though the BARN organization is relatively new (about 2 years old), its activities are already quite diverse. They have furnished their well-equipped artisan work center and are supporting open studio time. They are also performing community service projects with creative craft work, and conducting classes, tutoring and mentoring. 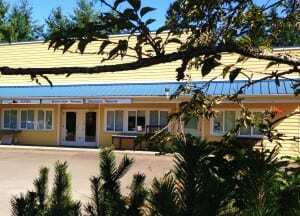 The interim artisan collaboration center and workspace is in this bright yellow building in the center of Rolling Bay 100 yards north of Bay Hay and Feed. A brand new BARN on 2 acres is on the drawing board. The BARN financially sustains itself through memberships, but it also offers occasional drop-in events and special events with a per-visit charge. It offers classes for the public, guest speakers and workshops. The BARN’s collaboration space in Rolling Bay is an interim location. BARN has recently purchased two acres of land just off 305 and Madison Avenue, near the Christmas tree farm north of New Brooklyn. Nationally recognized architect Johnpaul Jones (who was lead designer of the The Waypoint in Winslow) is designing a purpose-built new quarters for the BARN, for Asani to bring into reality. Asani is known for the green-built Grow Community, and the new building cluster that includes the Bainbridge Island Museum of Art. Bring your curiosity and creative energies to the BARN this Saturday from 1-4pm in Rolling Bay, at 11272 Sunrise Drive. Credits: BCB host: Annie Osburn; BCB editor and intro music: Tim Bird; BCB ferry music: Dogfish Bay Studios; BCB podcast art: artopia creative.